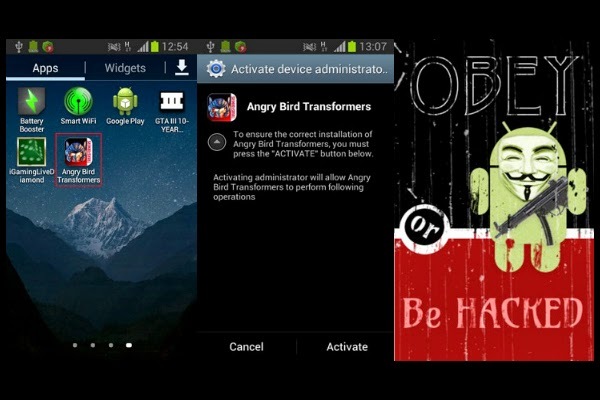 Security Researchers from Dr.WEB discovered a new android malware posing as Angry Bird Transformers. It has been categorised as a "vandal programs" as researchers has not find any code which indicates that the creators of the malware will have any financial benefits from it. These types of malicious programs are rare nowadays and are done only to show the programming skills or to make mischief. Dr.Web added the malware to its database under the name of Android.Elite.1.origin. Once this malware is granted permission, it starts formatting the SD card. The malware also blocks access to popular messengers like whatsapp messenger, hangouts or standard SMS application by displaying a message "OBEY or Be HACKED". "HEY!!! [contact_name] Elite has hacked you. Obey or be hacked. Elite has hacked you.Obey or be hacked." We advise our readers to be cautious and to install application from trusted developers only.